Active, healthy lifestyle is adopted by many young people nowadays. Dancing is one of the greatest means for self-expression. 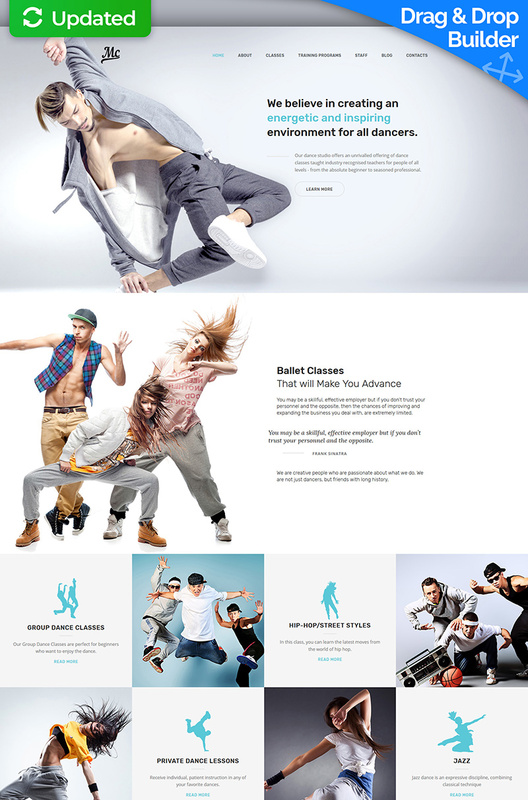 Involve more people into the wonderful world of gracious movements with Choreography Moto CMS 3 Template. Its author uses big images and concise texts, which makes the website more interesting to browse and easier to comprehend the information featured on it. Dance styles are presented in the grid structure. Coaches and Instructors section is beautifully illustrated, which makes it more trustworthy. Events schedule on the home page will keep your visitors tuned. The theme is also equipped with noticeable contact details and a Google Maps plugin. This will help dancers find your studio without fuss. Donâ€™t miss a chance to promote your business online, get the template today and launch your own website tomorrow!